It’s a common misconception that rooftop units cost more to operate because of their direct sun exposure. While residential rooftop heat pumps are most common in places like Phoenix, packaged heat pumps are installed on commercial roofs worldwide. They do however need to be built to withstand the elements – especially in Arizona. The Trane XR14c is built for just such touch conditions. Even looking at it you can tell it’s built tough! Regional energy efficiency standards require all new AC units installed in Arizona meet minimum efficiency standards of 14-SEER. The highest efficiency packaged heat pumps on the market today achieve 16-SEER. With the toughest compressor ever made in our opinion, chances are slim you will have to replace it. If you’ve ever had to replace your AC compressor before, you know it’s an expensive endeavor. The compressor is the heart of the heat pump. Like open-heart surgery, it requires a lot of training, time, and precision. The single-speed ClimaTuff compressor is manufactured by Trane themselves. It’s probably the main component that earns their right to claim “Nothing Stops a Trane”. Sound levels are measured in decibels (dB). Decibel ranges of the Trane XR14c packaged heat pump range between 68dB and 76dB depending on size. As package rooftops go, that range is between very quiet, and slightly quieter than the competition. By way of comparison, a conversation between two people next to each other will range between 60 and 65dB. Considering it’s up on a rooftop, you’ll be hard pressed to hear it at all! In most cases packaged units are installed on the roof of the home so rarely is noise a major factor. However, if it is, the XR14c is a good choice compared to its louder rivals. Trane’s patented composite material Vortica™ blower. Aluminum outdoor coil. Aluminum coils are less prone to refrigerant leaks than copper coils. Coil Guard protection keeps your unit cleaner and more efficient. Powder-coat paint keeps your unit looking new longer. 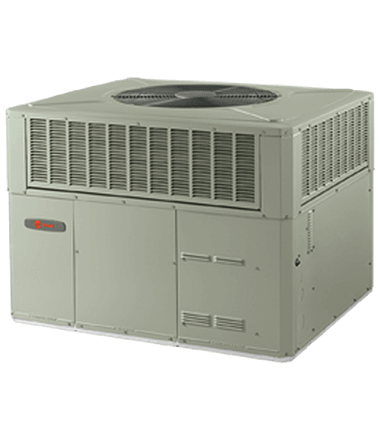 The Trane XR14c packaged heat pump is backed by a factory 10-year warranty on the outdoor coil and functional parts. It also includes an industry-leading 10 year limited compressor warranty. Magic Touch Mechanical has installed thousands of these units over the past two decades. Many of which are still running strong today from 20-years ago. It’s rather quiet, for a rooftop unit, and…it’s a Trane! As we’ve commented on with other Trane package heat pumps, it is one of the priciest PHP’s on the market. However,considering its record for long life-spans, and lower failure rates than most of it’s competitors – it has a lower-cost-to-own over time than most. How Much Does the Trane XR14c Cost? Choosing a new cooling and heating system is a 10-15 year plus commitment (unless you choose the wrong installing company). We work in thousands of homes around the Phoenix valley each year and unfortunately see the discomfort, aggravation, and expense their owners deal with when the whole “system” was designed and installed improperly. Aside from things like free maintenance, an ACCA approved Manual J load calculation, optimized airflow design, and more, there are many things that set a Magic Touch Mechanical installation apart from the others: What’s Included With This Installation? Installed pricing varies depending on where you live, and specific application. Expect complete installation of the Trane XR14c packaged heat pump to range between $5,000 and $8,500 including tax – before rebates, promotions, and local utility participation. (Depending on size, upgrades, factory rebates, tax credits and contractor promotions). With rebates, utility participation, company sales, etc. it may be possible to save a couple of thousand dollars or more on this system. Copyright © 2019 Magic Touch Mechanical. All Rights Reserved.